Last week, I wrote about my plan to try one recipe per week from my favorite cookbook, Mark Bittman's How to Cook Everything (HTCE). Because learning How to Cook Everything is quite a lofty goal, I'm calling this series How to Cook Something! Tonight, I made 2 recipes from HTCE. I adapted each of them a bit, and the recipes below include my changes. First up, Quinoa "Pilaf." Quinoa is kosher for Passover, who knew? Plus it's fun to say... quinoa quinoa quinoa! I added to Bittman's recipe by tossing in some golden raisins and pine nuts just before serving. Next time I might cook it just a few minutes fewer, as it burnt a tiny bit at the end. Overall a quick, versatile side dish. You can simply dry-roast quinoa in the skillet before adding stock or water, but this method is even better. 1. Place the oil in a medium-to-large, deep skillet and turn the heat to medium. A minute later, add the onion and cook, stirring occasionally, until the onion softens, about 5 minutes. 2. Add the quinoa and cook, stirring, for a good 5 minutes. Season with salt and pepper, then add the liquid all at once. 3. 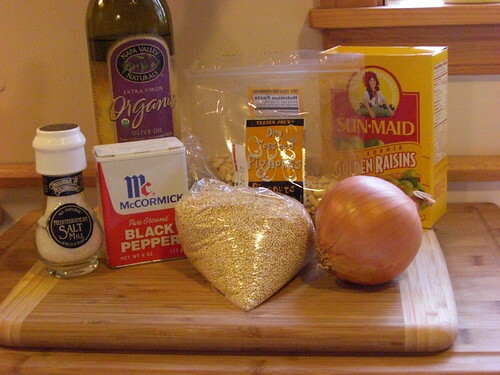 Cover and cook until the quinoa is tender, about 15 minutes. 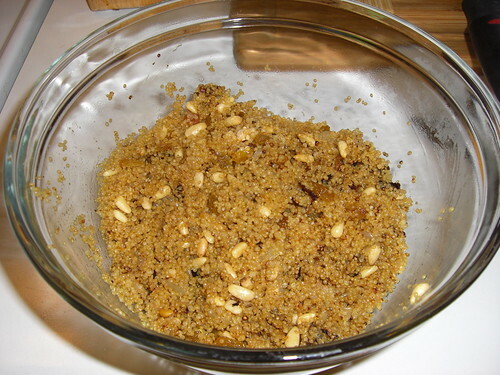 If all the liquid has been absorbed but the quinoa is not tender, add 1/4 c. water and continue to cook until tender. If any liquid remains, remove the lid and raise the heat a bit, stirring, until the liquid evaporates. 4. Stir in raisins and pine nuts just before serving. HTCE has lots of variations on basic recipes, and for our main dish I chose to make Grilled or Broiled Chicken Cutlets with Honey and Cumin. There are 8 other modifications on the basic grilled chicken recipe alone, which I love because it really helps a beginning chef (me!) master a dish while maintaining some variety. We used our grill for the first time this spring, and the chicken was moist and flavorful. I'm going to share both the basic recipe and the variation with you. 1. Start a charcoal or wood fire or preheat a gas grill or broiler. The fire should not be too hot, but the rack should be fairly close to the heat source, 4 inches or less. If necessary, pound the chicken slices lightly between 2 pieces of waxed paper so that they are of uniform thickness. 2. Brush the chicken pieces with the soy sauce and sprinkle with pepper. If you have time, let the chicken marinate in the refrigerator for 1 hour or more. 3. 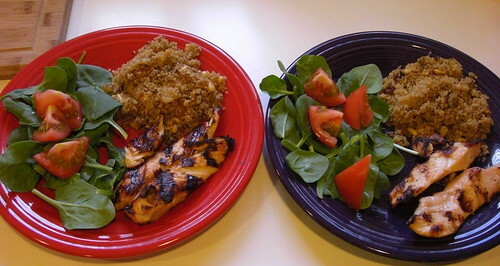 Grill or broil the chicken very quickly; it should take no more than 3-4 minutes per side. Sprinkle with lime juice and sesame oil; serve hot or at room temperature. In step 2, rub the chicken breasts with 1 tsp. olive oil (omit soy sauce). Combine 2 tbsp. honey, 1 tbsp. dry sherry, white wine, freshly squeezed orange juice, or water [I used OJ], 1 tsp. ground cumin, 1/2 tsp. minced garlic, and salt and pepper to taste. Brush mixture over chicken. Grill or broil the chicken as in step 3, brushing once or twice more with the mixture (omit lime juice). In other news, I'm thrilled to announce that I made an exciting purchase today: a grown-up camera! It's a digital SLR. I've often read that just because I have a fancy camera doesn't mean I'll automatically be taking amazing pictures, so I'm certainly expecting a learning curve. I'm really looking forward to teaching myself the art of photography, because I know next to nothing at the moment.